Taking a break from the Scottish beers and back to a beer that has regularly landed in my shopping basket the last couple of weeks, probably due to being on offer which is always a bonus. Konrad as I will call it is a Czech pilsner... Pours golden with a white head. A lot of light malt, bread, a bit of hay and a mild saaz hop bitterness on the intake leaving a lingering malty sweetness in the aftertaste. Very tasty pils and way above, to borrow a phrase just this once, poxy McLagers. 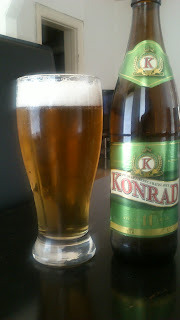 Excellent pilsner, good value for money and hit 6.5/10 on the beerometer. Mikkeller - Åarh Hvad ?